People get married without really knowing what it takes to BE married. Couples can get so focused on the wedding day itself, that the rest of marriage–the rest of your life–is skimmed over. You’re happy, maybe a little stressed (about the day itself), and focused on creating a nice day–your wedding day. After that, you optimistically think, you will live happily ever after. So much effort and focus goes into the big day, that afterwards couples don’t have a plan for the rest of their lives. I want you–and everyone–to have the relationship of your dreams. The quality of your relationship affects the quality of your life. How do you make sure you succeed in your partnership if there’s that nagging little statistic that 50% of marriages end in divorce? Oh, and just so you know: the statistics are higher for second marriages. Hold up–there is good news! There are many things you can do (that are proven by research to work) to ensure you have a wonderful, loving, healthy, and long-lasting marriage. Just like the vow of commitment you took when you married your partner, these 8 secrets also require you to commit to doing them on a continual basis. You can’t just do them today, or this week, then stop because you forgot or they are just not working as fast as you’d like them to. 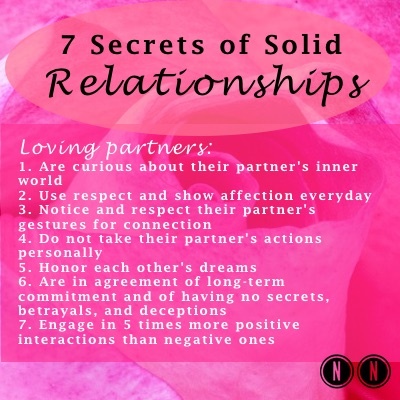 These seven tips (see below) you can use right now to take your relationship from good to great! You can use these 7 secrets to change your relationship–starting today! If you know someone who can benefit from this, or if you like this article: please like or share this on FB, tweet it, link to this, and/or leave a comment. Let’s get the word out on what it takes to have an extraordinary relationship! My mission is to help as many people create loving and long-lasting relationships as possible! If your relationship needs some much needed attention, and you’re not sure just reading articles like these and books will help, I invite you to discover relationship coaching. You can find out more by clicking here: Relationship Coaching. Is this you? You’re in a relationship that is blah and has lost its spark. Or, you’re on the fence and you’re not sure you want to stay in the relationship. Lots of people begin to address their relationship issues first by looking for information that’s out there–in books, a program, a workshop, or in articles like this one on the Internet. There’s nothing wrong with that, but what if the things you read aren’t proven or even accurate? What if they are based on information that is years or even decades old? How will you know what helps and what doesn’t? Sometimes things get too uncomfortable so one or both partners reach out for help with a counselor or a coach. Lots of people go to marriage counseling only after their relationship has gotten into the danger zone–or close to it. By then, at least one partner has their foot out the door. If you’re not too sure about committing to counseling or coaching, but you know your relationship needs attention, COMING SOON I’ll be offering 3 downloadable programs you can use right away in the privacy of your own home–and you don’t need to have your partner do it with you. These step-by-step programs have tons of proven tools, strategies, and information that really work! THE NEXT STEP You are thinking of taking the next step to long-term commitment–you are thinking of moving in together or getting married. You love this person but you want to make sure you “get off on the right foot.” To make this work and take your relationship to the next level, you want to be sure you have the right foundation in place. RELATIONSHIP REJUVENATION You are married or in a long-term relationship. Maybe it’s boring. You want the spark and passion back. Or, you’re arguing or ignoring each other and you’d like to argue less and stop hurting each other as much. RELATIONSHIP RESCUE You are in a committed relationship but you are “on the fence” about whether you should stay or go. You and/or your partner have thought of leaving the relationship. You might even be thinking it is too late to save it. While all marriages may not be made to last, you’d like to make sure that you can say you tried to rescue your relationship. If you determine that it can’t be saved, you’d like to separate on good terms with the clarity, tools, and peace of mind that you tried your best to succeed with this relationship. Thank you for sharing! I think it’s so important to recognize when it is time to seek help!